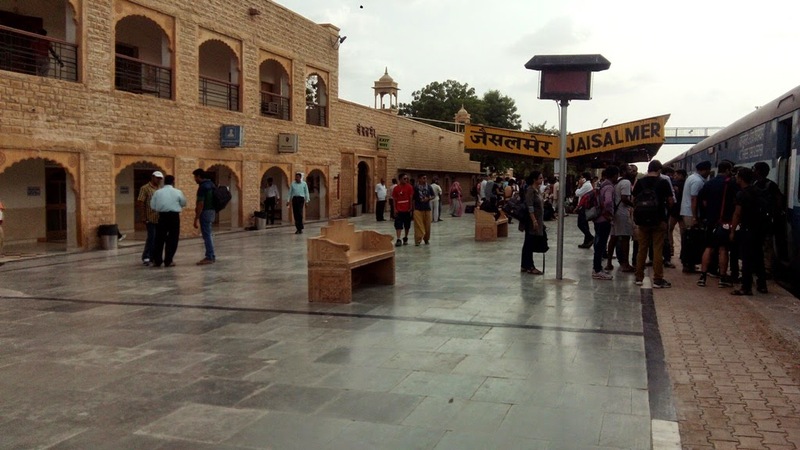 A trip to the Pink City : "Jaipur, Rajasthan"
During Dussera holidays, I have been to the Pink City, Jaipur, the state capital of Rajasthan. Pink color symbolizes the hospitality. In 1876, during the visit of Queen Victoria, the then king of Jaipur, Maharaja Ram Singh painted the whole city with Pink color to welcome the queen. Pink in color and pink in vibrancy, the city of Jaipur is one of most beautiful and magnetic cities of India. Jaipur is named after the Maharaja Sawai Jai Singh II, who had established the city. He was not only a great warrior but also an astronomer. 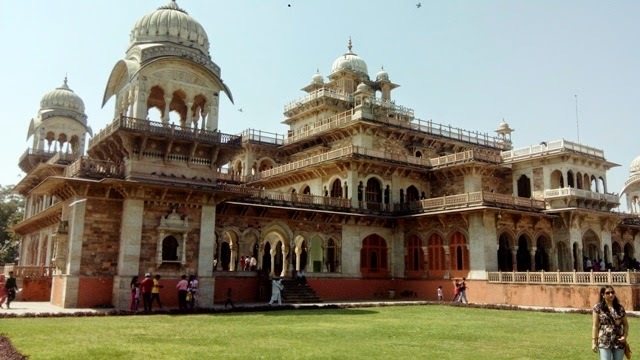 The glorious past of Jaipur comes alive in the Palaces, Forts and monuments made by the royal family. The culture, architecture, traditions, art, jewellery and textiles of Jaipur have always charmed the visitors. Including the weekends, I had a 4 days holiday this Dussera. This was the first time, we colleagues could not plan a single trip ourselves. Few of them teamed up with their friends to enjoy the holidays and few decided not to have any trip. As I had already made-up my mind to go on a trip during the longest ever holidays, I had to go alone. I had my ticket booked online via Red Bus and the bus was scheduled to leave from Fatehpuri (near old Delhi railway station) around 11:15PM. As I was not aware about the locality and the bus stand, I left little early from room. After reaching old Delhi railway station around 9PM, I had to ask only a few people to reach the travel agency's desk. I just confirmed my ticket booking and went to have my dinner. After dinner, I had around 1.5hours time. Near the place, in one of the Dussera grounds, the famous epic Ram-Leela stage show was going on. I enjoyed the 1.5hours watching the show. The stage show was really amazing, be it the dialog delivery of king Ravan or the simplicity of Ram or the cuteness of children performing the role of monkeys in Ram's army. I came back to the bus stop before the show ends and board the bus. As I did not have a prior hotel booking, I get down at the last stop of the bus, just before the sun-rise on Friday. As I had decided to visit most of the places in a stipulated time, I booked an economy hotel, where I can get fresh and keep my luggage. 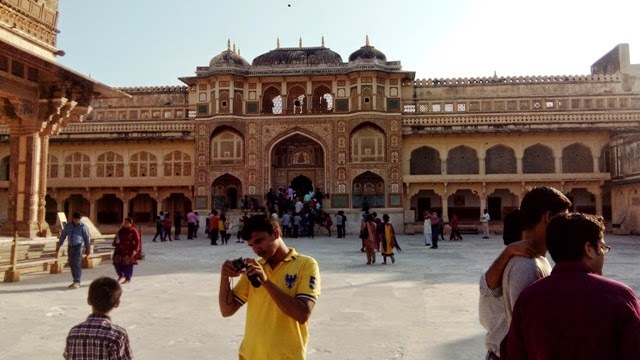 In Jaipur, the hotels provide sight seeing facility for their guests. As I was alone and reached early in the morning, it was a little difficult for them to arrange a ticket in the sight seeing bus, but somehow they managed to get one. I had my breakfast and wait for the bus to come. The bus started around 9:45AM and picked passengers from two different locations. In the bus, we had travelers from different parts of India, like Odisha, Delhi and Bihar. We had a guide in the bus, but was of very less use, as he was with us only inside the bus and much more like a time keeper than a guide. Any way, we started the day's trip by visiting the Birla Temple in Jaipur. It is situated in a beautiful place, just in front of the JDA (Jaipur Development Authority) office, on a small hill. Apart from the Birla Temple, there was another temple on the same hill devoted to Lord Shiva, in a small fort on top of it. 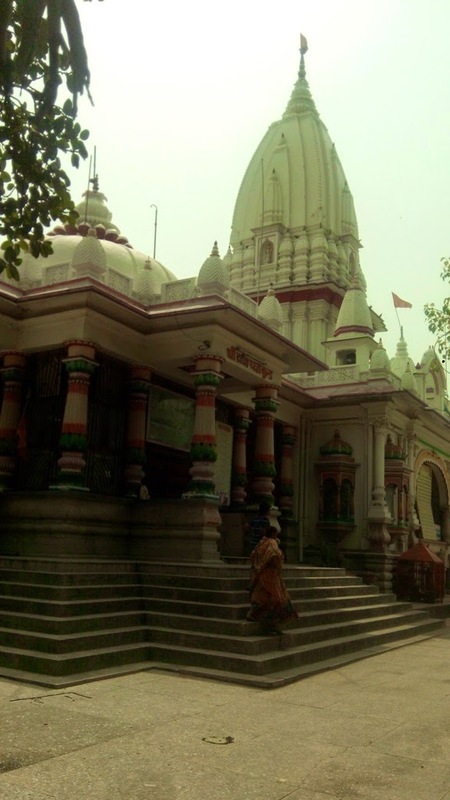 We did not went to the Shiva temple, as it opens only on the day of Shiv Ratri. The next place we visited was the Albert Hall Museum. The museum is undertaken by government and by look, much more like a palace with beautiful and ornamental decorations. As other museums, it houses many old items, like the different war equipments, beautiful pottery items used by the royal family, idols of different religions etc. Apart from these, there is a mommy of a lady, huge shields (made of bronze, brass etc and decorated with scenes from stories of Hindu Epics), huge pots (mainly used for decoration in royal palace), age old cotton fabrics painted using organic colors (colors extracted from organic products like fruits, leafs, oils etc). After visiting the museum, we had some snacks and went to the City Palace and the Jantar Mantar. City Palace is located in the heart of the city, where all the building, walls, gates are painted in Pink color, rather very very dark pink color. 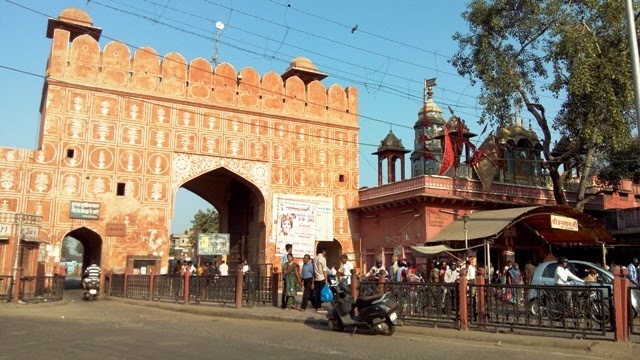 The gates like the Ajmeri Gate, Chandpol Gate are made for security as well as business check. Now we were in such a place where you can feel why the city is called Pink city. On the way, the guide just pointed us to the Hawa mahal. Our bus took us to the Jaleb Chowk. From there, it was about 200meters distance to Jantar Mantar and City Palace. First, I went to Jantar Mantar, to see the difference between that of New Delhi and Jaipur, though both are made by the Maharaja of Jaipur. There are many more astronomical instruments in Jaipur, compared to Delhi and in very good condition also. Few of them to name are : Yantra Raj, Krantivrtta, Sun Dials, Zodiac status, Sasthamsa etc. People who go there with a guide can know much more about their zodiac and how that changes with time, how location of celestial objects are measured etc. People can enjoy the evening light and sound show, if it is possible for them to stay till night. We just saw the City Palace from outside, due to lack of time. Any way, what I came to know that a major part of the palace is made a museum by the Royal family and rest part is a private area for them. We left from Jaleb chowk around 12noon and went to Amber Fort. 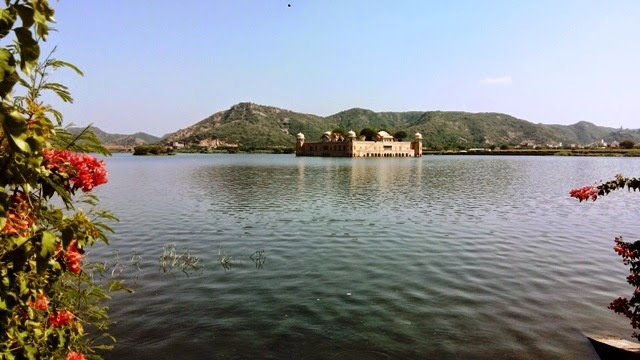 On the way we saw the Jal Mahal, a 6 century old palace located inside a lake. Now-a-days, it is banned by the government for travelers to go closer to the palace in the water, as the palace is not in good condition. There are local people who were selling wheat balls and other food for fishes. It is assumed that feeding fishes in the lake is good for fortune. 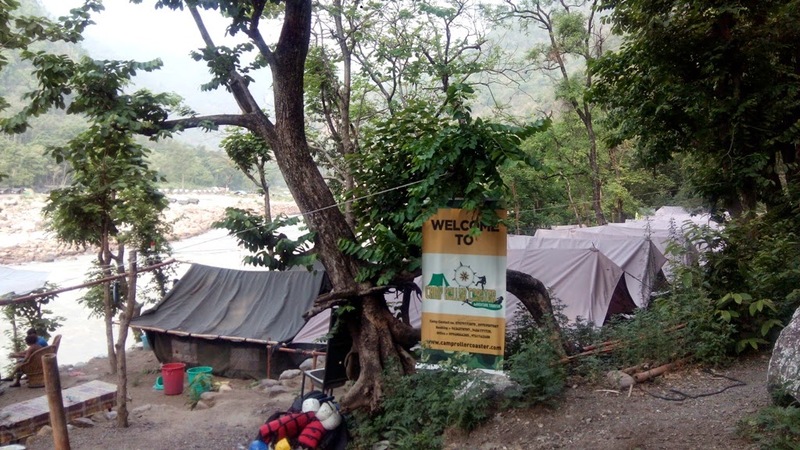 Just in the opposite of Jal Mahal, the RTDC fabric manufacturing and selling unit is situated. Few people bought sarees and blankets from there. I had my lunch during this time. 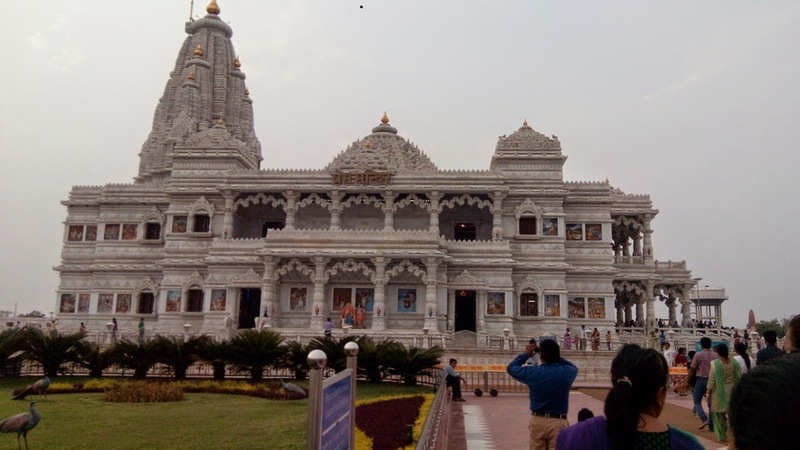 Just after that, when others were busy in lunch, I could have a glimpse of the Radha Madhav Temple and Kanak Vrindavan Garden located in Kanak Ghati. Post lunch we went straight to Amber Fort. We had to park the bus around 1KM away from the fort, as Goddess Durga's Bhasani procession was going on in the near by lake. The puja was also celebrated in the fort temple. 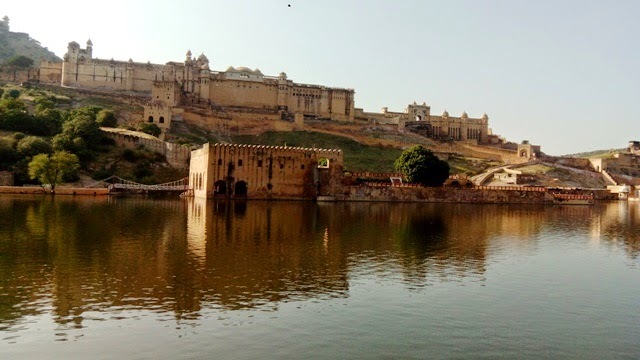 The Amber Fort, located on top of a mountain in the Aravali Mountain range, famous for being the home of Jodha, Emperor Akbar's wife. The place was really beautiful, in front of the lake, surrounded by mountains, each having walls and view points on top of them. The palace is well maintained and is a famous tourist attraction. There are shops inside the fort, from where devotees can buy puja items. I had bar myself to stand in the queue for puja by seeing its length. I went to the major part of the Fort, the Mahal. Just after crossing the security check, their exists the Dewan-e-khas, where travelers were taking rest after climbing the hill to reach the fort. The only facility to take rest is to sit on the floor, not bad for a person who really need some rest. The major attraction of the Mahal is the Shish Mahal, the glass palace. The walls and roof of the shish mahal is decorated with glasses of different shapes. In front of it, there is the flower garden. It was 5pm in the evening, so I had to wrap the visit quickly. 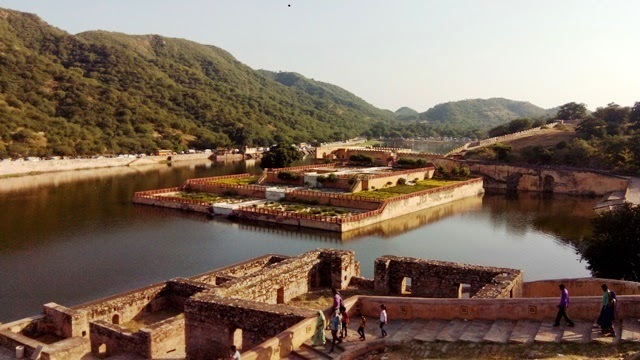 The view of the lake and the surrounding was magnificent from the top of the fort. In the lake, there is also a garden and a palace connected by a bridge from the road. I left the fort as the Sun was going behind the Aravali mountains and I had to catch the bus which was parked 1KM away. We spend sometime near the lake and came back to our hotel. On the way back, we had a glimpse of the Royal Gaitor from the bus. The day was hectic, but we covered a large number of places. I had my dinner in a near by restaurant, as the hotel restaurant was closed on that day, due to Dussera. For the next day, I decided to enjoy some quality time and see the city, where I can decide how much time I have to spend on a particular sight. 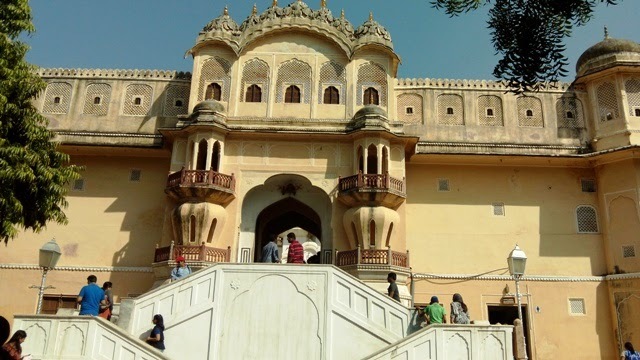 For the second day, I had few more places to visit, like Forts (Jaigarh, Nahargarh), Gardens (Jai Niwas Garden, Sisodia Garden) and Temples (Gobind Devji, Galtaji) etc. I started the day-2, by walk with my personal guide, my mobile phone (Google Map + AGPS). First I visited the the Hanuman Temple near Chandpole Gate. Then followed the guide and went towards Nahargarh fort. On the way I had to cross the fish market, mutton shops, groceries etc. The life of people is similar to what we generally have in our village. Children playing roads, queue in front of water tap, cattles tied to hooks in front of the houses etc. This was the scene of the from the "Purana Basti" of Jaipur, which is just at the downhills of Nahargarh Fort. In the village, there are few interesting that has happened to me due to my guide. My guide directed me to a path, where I end-up in reaching at few stair-cases followed by a iron grill. I had to open the grill to reach the road on the other side. 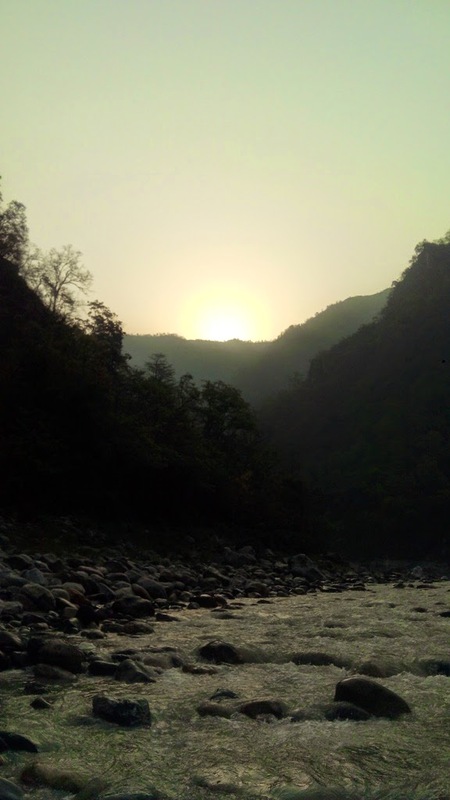 Any way, I reached at the foothills and the journey from there till the Fort was really tough, as it was like climbing on a Ghati. Just after reaching the fort, I went straight to the boundary wall to look a view of the city from the top of the mountain. It was an awesome view as the horizon shifted far away due to the altitude. One can point the City Palace, Hawa Mahal, Tal Katora Lake, Jai Niwas Garden and the Pink City (the pink colored buildings belt) clearly from the fort. 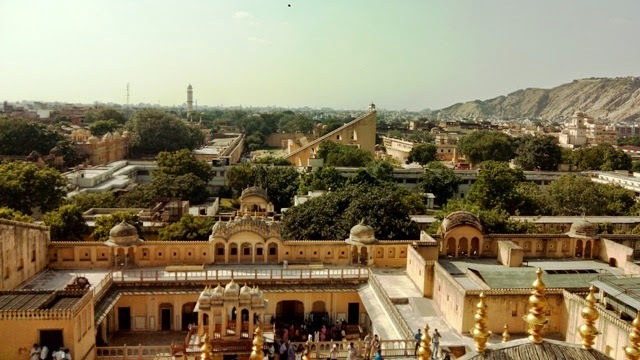 The old Jaipur city was surrounded by mountains from 3-sides. But now, the mountains are surrounded by the city for more than 270 degree, that I could see from the fort. 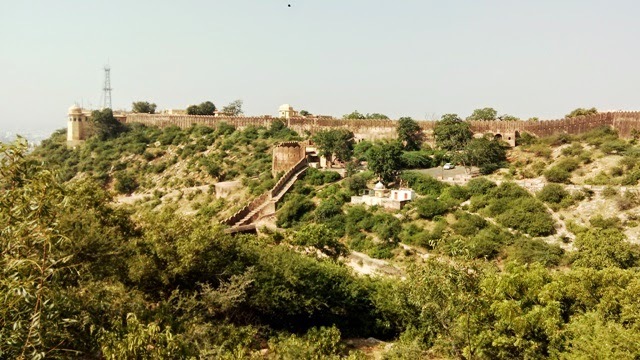 Nahargarh fort is not so marvelous compared to other 2 forts, still its importance was not negligible, as it was very close to the residential and business area. Apart from few secret rooms, all the rooms in the fort are connected to each other. I stayed there for 1.5hours and came back to the city. In the old village, I could find few shops, where bags, shoes etc are manufactured. I thought of taking a bag, as I was buying such a product from the manufacture directly. 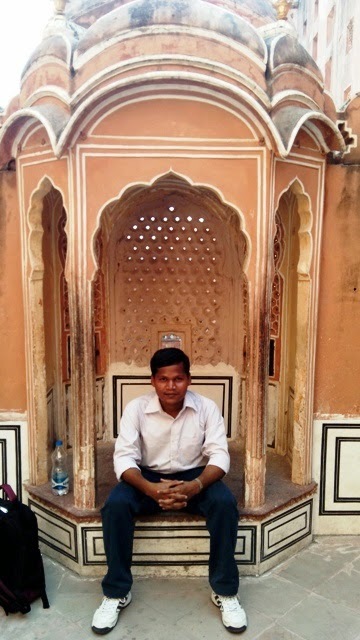 On the streets of Jaipur, I had fast food snacks, fruit salads, ice-creams etc until I reached the City Palace area. 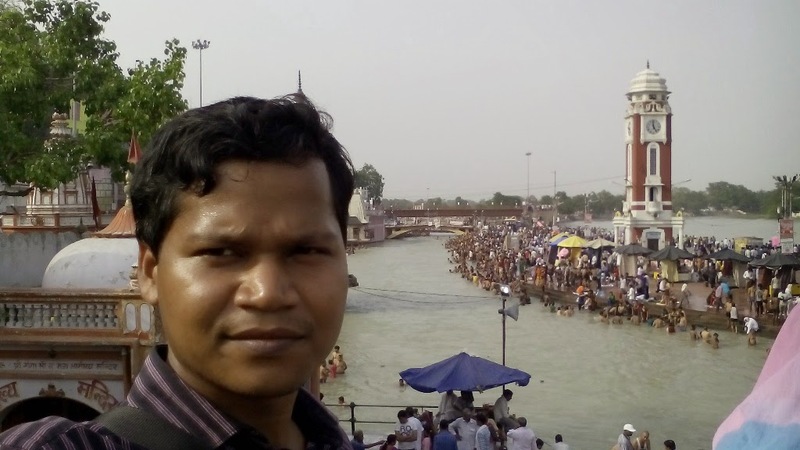 There I visited the Brajanidhiji Temple. 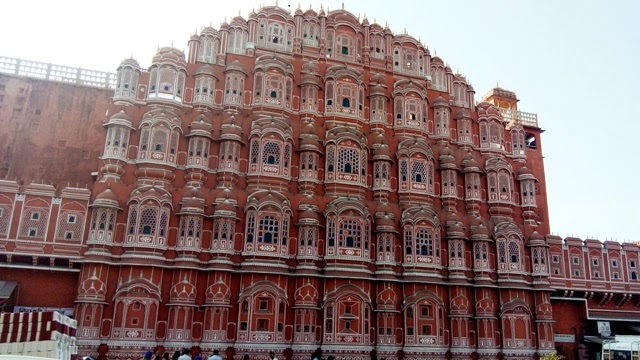 I went straight to Hawa Mahal, skipping the City Palace museum again. Hawa Mahal built in the shape of the crown of Lord Krishna, where multiple viewing windows were created for the ladies of Rayal Family. Through these windows, the Royal ladies were able to see the functions and processions that were held in front of it, not being noticed by others from reverse side. 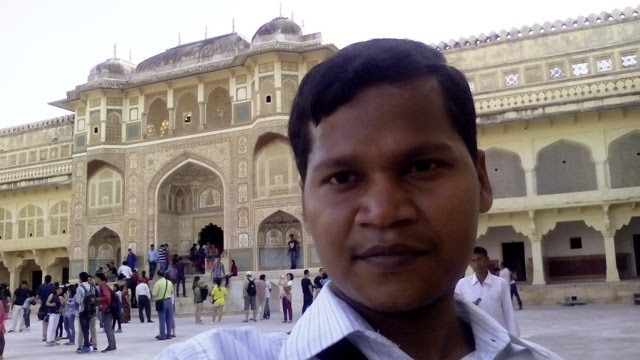 After visiting Hawa Mahal, I went to the LaxmiNarayan Temple, which is just opposite on Badi Chopade. But unfortunately, during that time the temple was closed and I had to move towards my next visiting place. 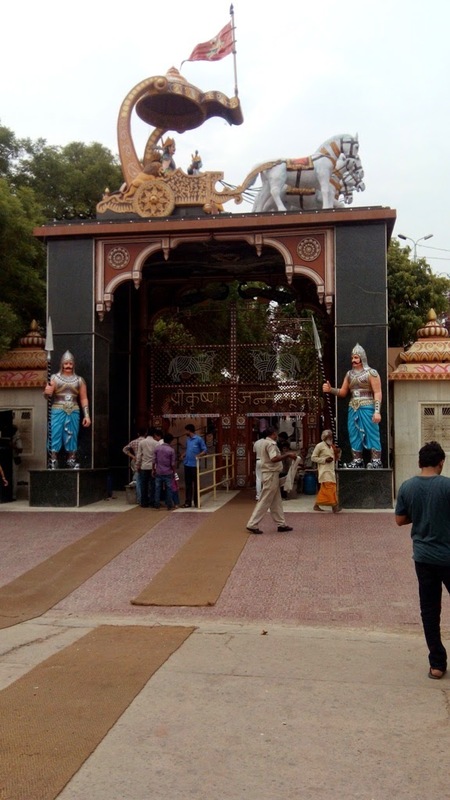 Due to afternoon time, the Govind Devji temple was also closed. So decided to go to the Jai Niwas Garden and see it. There were only few people sitting on the lawn and few children playing in the children's section.There was nothing else in the garden that was interesting, but was sufficient for taking rest. The Tal Katora lake was near by. The lake is surrounded by building from all sided, leaving only a 20meters long gate. The Govind Devji temple opened at 5:30PM and I took part in the aarati and stayed there for a hour. It was really stress releasing to be in such a place. 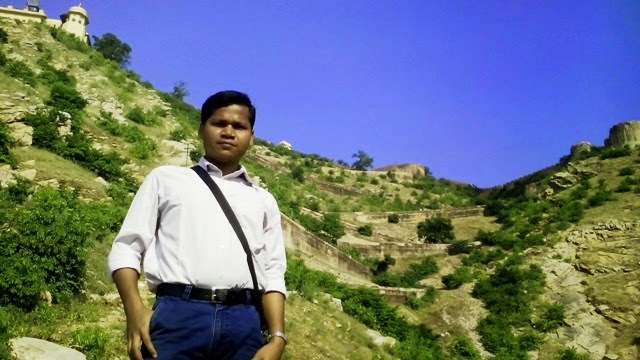 Before leaving Jaipur, the last place I visited was the Ram Mandir near Chhote Chopade.